On Thursday, 23rd October in London, Chef Tony Valentino Locke invites you to his Validation Dinner. Tony is an experienced chef with Italian heritage. He has been in the catering industry for more than 10 years, during which he has worked with some of the most respected names in the business, such as, Michel Roux jr, Marcus Wearing, Nobu Matsuhisa, Alyn Williams, Aldo Zilli and Cristiano Andreini. 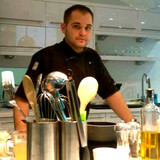 His passion for cooking started when he was a child at his Italian “Nonna’s” house. She would show him how to prepare and cook all of her home cooked specialties passed down in the family from generation to generation. Tony decided to go straight to catering college after he finished school. He graduated from a 3 year Professional cookery course with flying colors and had a great amount of food knowledge and experience. It was time to get out into the industry. Through his amazing career he worked in some of the most renowned Michelin stared restaurants in London, and Italy. Tony has also worked as a Home Economist for Television, magazines and newspapers. He has performed live cooking demonstrations at “Ideal Home Show” and co-hosted cooking Masterclasses alongside celeb Chef Aldo Zilli. His preferred cuisine is Italian, but given his experience in different cuisines, the menus and themes can be as diverse as you wish. Tony always sources the freshest produce, mainly organic and free range, from local markets and independent producers to make sure you get the best from every ingredient.